National Pride Pet Detective LED Blacklight is awesome! I have two cats and knew one of them was peeing somewhere in the house but wasn't sure where. Cat pee is one of those smells that is overpowering so I knew everyone that came in my house could smell it. I'd looked everywhere to try to find out where the cat was peeing and couldn't locate it. As soon as I took out the Pet Detective LED Blacklight I saw a large spot in the corner of my front entry room beside a plant. I never would have thought the cat could have peed there because the space between the plant and the wall isn't very large but sure enough when I smelled it there was no way it was anything else. Something else I noticed when using this Pet Detective LED Blacklight is that is picks up other stains too. Last year my child had the flu and unfortunately didn't make it to the bathroom and although I had cleaned it up with out carpet cleaner I now see that I didn't do a very good job. It was the middle of the night so I'll use that as my excuse. After cleaning up a few spots I found I used the blacklight to make sure all traces were cleaned up. My house is back to smelling fresh and clean. I'm a neat freak and if you are too, using this light may bother you at first but once you start cleaning up the spots you'll feel so relieved. Another great thing about this light is it makes scorpions glow. Living in Arizona can be fun sometimes..... While searching for spots I found a glowing scorpion crawling along the baseboard in my bathroom. Eeek! We also use it outside to find scorpions and remove them from the property. 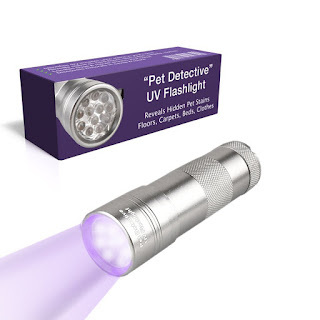 This Pet Detective LED Blacklight has so many uses and I highly recommend everyone have one in the house! 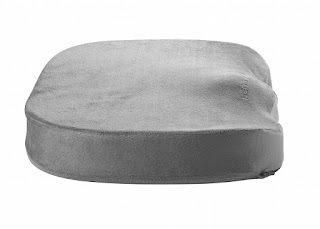 Comfy Cush orthopedic seat cushion, designed in the lab using 5 molds, is engineered to relieve lower back pain. It truly is comfortable... check our reviews. Is it a wheelchair cushion? Yes. This wheelchair friendly medical aid gives pelvic & hip pain relief. Plus relieves stress on lower back, spine & tailbone It's also anti-bacterial and anti-fungal. Is it a coccyx cushion? Yes. The memory foam absorbs and distributes weight evenly. This high density memory foam was originally designed to relieve G-force during lift-off. It's also a great pregnancy cushion. This Back Pain Seat Cushion is amazing! I've had horrible back pain the last few months. I blame it on lugging my six month old around all day but I think it's also from poor posture while sitting. The Back Pain Seat Cushion instantly relieved my back pain and forced me to sit properly which has helped with my day to day back pain. My lower back feels amazing and I love how soft and comfy the cushion is.